As Quinnipiac graduate guard Cameron Young stepped to the free throw line with 3:58 remaining, his team had closed the Stony Brook Men’s Basketball lead to just four when they were down 20 in the first half. Young’s free throws brought the game within three, and his point total to 29. The lead would decrease to two just 70 seconds later. Yet, the Seawolves turned up the same offensive pressure shown in the first half and finished the matchup off with a 10-2 run, securing their seventh victory of the season by a final of 71-61 on Saturday night. Head coach Jeff Boals believes his team’s style of play varied in the two halves. Stony Brook went into halftime with a 42-28 lead, with redshirt-junior forward Akwasi Yeboah and Young both leading the half in scoring with 14 points. The Bobcats did just that, as the team forced two turnovers in the first two minutes of action. The team would then go on a 12-5 run, which brought the score to 47-40 with 13:50 remaining in the game. 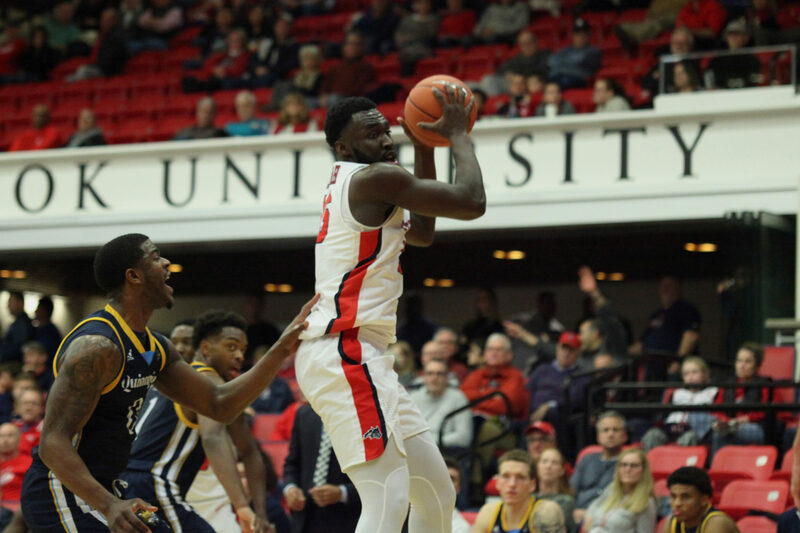 The later portion of the game saw a back-and-forth style of play, with the Seawolves making a push with a sophomore center Jeff Otchere dunk to increase the lead to 12. Young then took over for Quinnipiac, scoring six of the team’s next 11 points to bring the margin to five with 7:31. The graduate finished the half with 15 points, a rebound, and an assist. Boals later praised the guard’s effort in the matchup. The matchup edged closer as freshman guard Tyrese Williams scored a layup to bring the game within two with less than three minutes remaining. Just as the previous run, however, the Seawolves made a push to secure the lead and hold on for the win. The Seawolves started the matchup with a quick 25-8 run in the first 9:40 of the matchup, with 16 of the points coming from Yeboah and sophomore guard Elijah Olaniyi. The team dominated the offensive side of the ball through the first half, shooting 48 percent from the field and 60 percent from beyond the arc with nine 3-pointers made. The Seawolves now ride a five-game winning streak and will face Manhattan College next on Wednesday, Dec. 5 at 7 p.m.